• Holy Thursday is a celebration of the Institution of the Eucharist and the Priesthood and a reminder of the last command of Jesus for disciples to love and serve each other. There are some dramatic images of blood being painted on doorways and a humble servant washing dirty feet. Both are heavy with meaning as we enter the celebration of the sacred 3 days of Easter. • A lamb being sacrificed and the blood placed on the doorways of the house caused the angel of death to pass-over the house. All the houses not marked with blood were affected by death (see Ex 12,23). Symbolically blood represented life. It also had the power to overcome sin and death. It cleansed. It forgave sin. Can you make the link between the Passover lamb and Jesus being the “lamb of God who takes away the sins of the world“? What is the significance of Christ’s blood? • In a typical Jewish celebration of the Passover meal the Father would take some unleavened bread and remind the family of having to leave Egypt in great haste. Imagine the surprise of the disciples when Jesus speaks not of the Exodus or unleavened bread but states his own body will bring about a new Exodus / Passover. Jesus is replacing the Jewish Passover with new sacramental words and signs. What links can you see between unleavened bread and the gift of Jesus’ body? • To understand the Eucharist we need first to understand the Passover (which the Eucharist fulfills and replaces). In the Jewish Passover there were four cups of wine. The second cup was the most important. It remembered the blood of the lambs sprinkled on the doorposts. Jesus in the words of institution at the last supper did not make reference to the blood of the lamb, but instead states he is beginning a new and everlasting covenant with his own blood. How is Jesus fulfilling and replacing the Jewish Passover? • St Paul’s letter to the Corinthians is one of the earliest passages of scripture in the New Testament. Paul states very clearly that what was handed on to him about the celebration of the Eucharist was connected with Jesus’ own words and command at the last supper. If the Eucharist is proclaiming the death of the Lord what does this mean for you? For the world? • St John does not have the last supper scene like the other gospels. Instead John teaches Christian disciples that to celebrate the Eucharist is by implication to participate in the life of Jesus who emptied himself, washed, served. 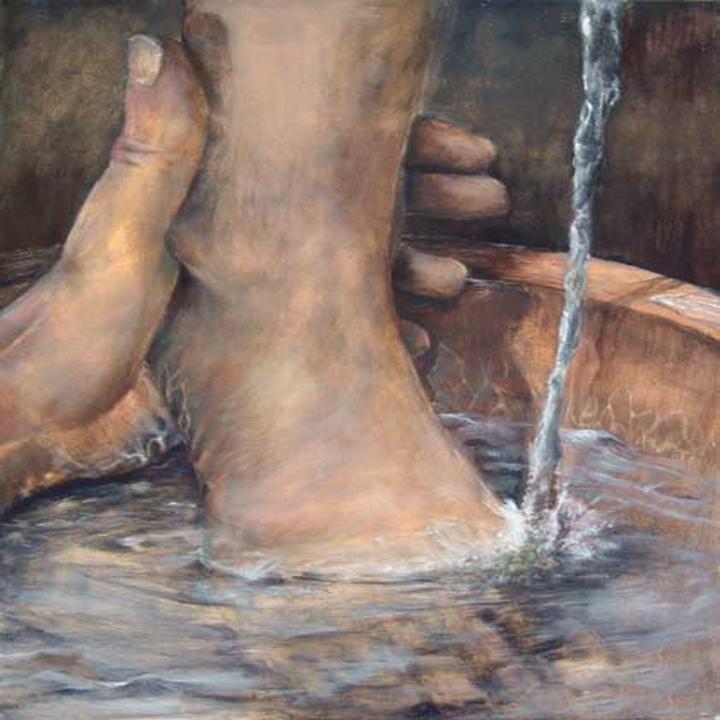 Foot washing was considered such a lowly task that even Jewish slaves were not expected or asked to perform it! John teaches us NOT to disconnect the Eucharist from our service to repair and heal the world. How does Jesus’ last example and the tools of the trade of a basin and towel challenge you today? • What does self emptying work mean? How does loving service, without desire for return, still surprise today? Is it recognised as the ‘trademark’ of being a Catholic/ disciple? What does washing the dirty parts of humanity, look like in our society today? This entry was posted on Monday, April 15th, 2019 at 1:54 pm	and is filed under Active Christianity, Discipleship, Eucharist, evangelisation, Holy Thursday, Humble servanthood, Love, Passion of Christ. You can follow any responses to this entry through the RSS 2.0 feed. You can leave a response, or trackback from your own site.